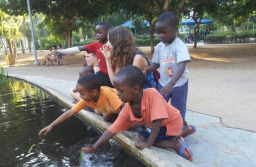 Our mission is to rescue hundreds of the refugee babies and children in southern Tel Aviv from the devastating cycle of poverty and hunger in which they are trapped in Israel. "Elifelet" is a winner of Yigal Alon award for outstanding pioneering action of 2015. Our volunteers rescue hundreds of children from the cycle of poverty and hunger. The exact number of refugee children in Israel is unknown since the State of Israel does not allow the parents to register babies at their birth. These children are literally "transparent", mostly unknown, do not exist for the State and therefore the State is not obliged to take any responsibility over them. Most of these children have no medical insurance and there is no follow up after the state of their health and development. Many of the children live in intolerable conditions in terms of nutrition, hygiene and safety; the kindergartens lack equipment, toys and development stimuli. Started with supporting one refugee kindergarten, today "Elifelet" is supporting five kindergartens (about 200 babies, children and their families). In 2015 Elifelet had established a first after school facilities - HOMADE.